Standby Tissue is back again! 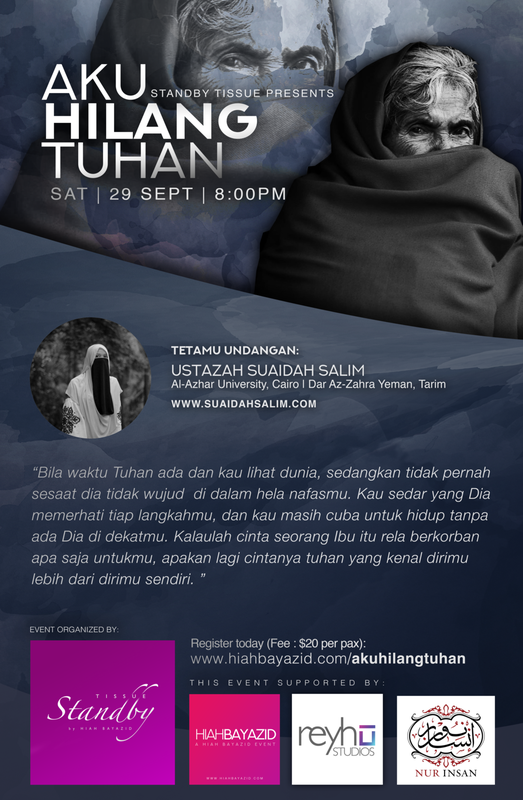 Aku Hilang Tuhan (I Lost God) is a topic close to our hearts. All of us have been at the lowest point of our lives and at times we question why certain things happened to us. We did everything to be a good person yet we are still drowning in misery. Unexplained and unfortunate series of episodes,we often ask “why me why me”. And at that moment we lose ourselves, we lose our solat a few day by day, we stray away of what is good for us because we thought that He was unfair. Little did we know that He is watching with Mercy. In this heart to heart session, we are going to share and discuss how we can cope during this trial times, how we can reconnect to the right path and redeem ourselves and finally “find” Him. Ustazah Suaidah Salim | in Nov 2011, she conducted In-Home Quran coaching for children and families. In 2012, she expanded her program called Open Quran and Celebrate Quran Training guide for ladies, mothers and educators. In 2015, Little Quran Kids was born, with one intention: To put Allah & Rasulullah in the kids heart by memorising Juz Amma. She went through her Islamic education 12 years in Madrasah Wak Tanjong Al-Islamiah, took her BA Syariah Islamiah in Al-Azhar University, Cairo, Egypt and continued her dowra in Dar Az-Zahra’, Tarim, Yaman. We would like to thank everyone for coming to our event. If you missed this, check out our upcoming events!